While entering the theatre, I kept reminding myself to not let Amit Trivedi’s music raise my expectations for a movie based on a Chetan Bhagat novel (The Three Mistakes of My Life). To be precise, based on the worst Chetan Bhagat novel I have read that also happens to be the worst book I have ever read and will be the last book I read from that author. Now that I have bashed the book, let me also admit that director Abhishek Kapoor’s translation of it to a movie is, if it were to be described in a word, fabulous! I remember reading the book many years ago and feeling that it was filmy, the characters were single layered and in the last few pages suddenly a lot was happening that was proving too much for a writer like Chetan Bhagat to handle. To give a cinematic parallel, it was like Rohit Shetty making a Rang De Basanti. So then why is movie so good? Because the director ensures what others, like say Karan Johar can never manage. He makes the principal characters and the setting (middle class Ahmedabad) very real. 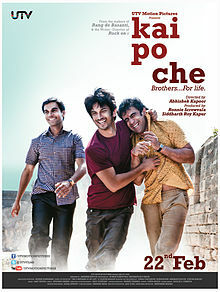 Govind (Raj Kumar Yadav), Ishaan (Sushant Singh Rajput) and Omi (Amit Sadh) are your regular neighbourhood bunch of boys but each with a unique personality trait. Govind is the numbers person wanting to make it big in business, Ishaan is the instinct trusting local cricketer who did not make it through the maze of selection politics while Omi is the slightly naïve, but ever supportive and resourceful friend. Ishaan’s attachment to Ali (Digivijay Deshmukh, brilliant!) the gifted kid, who can spot a cricket ball like a football, seems like the crack that will divide their friendship but a sensational cricket series (India-Australia, 2001) is all that the friends need to bond again. A cricket series ending differences between friends seems a bit plastic to read, maybe the same curse that the book suffered from, but credit to the director for making it all so believable in the movie. The movie further captures the trials that the friendship goes through as life throws many a challenge at them, natural (Gujarat earthquake) and man-made (Godhra riots). Aided by a fantastic music score (Amit Trivedi) and ARR-esque background music (Hitesh Sonik) and some mind blowing cinematography (Anay Goswami, will not forget the earthquake sequence for a while!) and well supported by an able supporting ensemble (Manav Kaul, Amrita Puri n co), the three leads deliver a fantastic performance each. Casting all new faces (almost all new, as Raj Kumar has been around) was a cinematic masterstroke. From the awkward scenes when his friend’s sister makes a move on him to his outburst when his dreams are shattered, Raj Kumar (Ragini MMS, Talaash among others) delivers a restrained yet pitch perfect performance. Amit Sadh too is excellent, saddled with the least meaty role he manages to hold his own with minimal dialogues and then delivers the sucker punch to remember in the end. But the scene stealer is surely debutant Sushant Singh Rajput as Ishaan. Definite to pull the middle aged aunties to the theatres with his TV background, Sushant has terrific screen presence. There are certain parts when he plays to the gallery but he manages varied emotions with the ease of a veteran on screen. Wanting to be tough yet being vulnerable he makes you root for him throughout and moves you immensely in the end sequence. Back to dishing out the thoroughly deserved compliments, the director needs a pat on the back for treating certain sections of the movie with utmost sensitivity. The Godhra riot scenes do evoke a sense of real dread and you find yourself rooting for a different ending than the one playing in your head. If one had to find flaws in the movie then possibly the middle portions when the screenplay goes flat or the jerky manner in which the romantic angle is handled can be brought up. Or maybe minor details such as the lead actors having perfect abs in an otherwise realistic setting and the complete absence of any romantic angle for the remaining two leads could be the missing elements in an otherwise satisfying movie. But these are just small flaws which one has to strain to recollect. From his acting days in ‘Uff! Yeh Mohabbat’ (1996) to direction with ‘Rock On!‘ and now Kai Po Che, Abhishek Kapoor has evolved immensely and his talent as a film maker can neither be underestimated nor ignored anymore. I foresee list of A+ actors queuing up to work with him now. Rating: 3.5/5. Thankfully for me, I did not recollect major chunks of the book and hence there was a certain air of unpredictability. To be honest, the drama onscreen was too riveting to think of anything else! Go watch this one, if you have not done so yet. The title for the uninitiated literally means ‘Have cut it’ and is the exclamation for a kite being ‘cut’. The title definitely does not stand for abbreviations for the names of the three lead actors as my friendly neighbourhood Mallu assumed. In his defense, Kai, Po and Che are names even I have heard before! To end on a cryptic note, this review is dedicated to Po.